Whether you have an indoor or outdoor cat, every cat deserves a place to call their own. Most cat owners invest in a warm, comfortable bed for their beloved pets, but sometimes, your cat craves a little more excitement. With a cat condo, you provide your feline friend with a place where they can sleep, play, and get the stimulation they need to stay happy. From cat condos where your cat can truly be king or queen of the castle, to those that offer a multitude of fun ways to keep your cat entertained – there are plenty of excellent designs to choose from. To help you decide which condo will be perfect for your pet, we have put together our top 10 cat condo picks, along with the key features the and pros and cons of each cat condo. As an affordable option to introduce your cat to the world of cat condos, the Cat Tree Furniture Condo from Go Pet Club is an excellent choice. 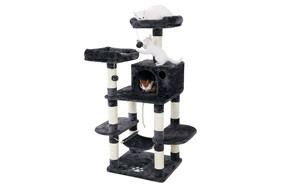 The cat condo features 3 levels for your cat to enjoy, each one offering a different experience. From the strong and sturdy base, three pillars and a tiered cat climbing slope lead up to a fun hiding nook, with two entrances for your cat to either sleep or further explore from. From the two higher platforms, there are fluffy toys attached to keep your feline friend entertained, or the raised platforms also make for fantastic sleeping platforms. With the additional benefit of each of the 5 pillars having sisal scratch rope attached, to keep your cat’s claws sharp, you won’t need to worry about your cat testing its claws on your furniture. For medium-sized cats, this is a fantastic option for a cat condo. The Cat Tree Furniture Condo, designed by well-known brand Armarkat, is an excellent choice for a strong and well-built cat condo, created to withstand the force of medium and large cats. Ideal for cats that love to explore, the condo has a great endurance, so should last through even the most intense of play sessions. The condo itself features 5 scratching pillars, each of which is fully covered in rope for extra scratching area, and 3 platform tiers. The first tier, featuring a large cat nook that’s ideal for cats on the larger side, can be accessed by the sloping ladder, clad in the same faux fleece as the rest of the cat condo. The covering makes for a comfortable place for your cat to relax, while the included cat toy is great for cats who love to play. For households with multiple cats, or homes with cats that love nothing more than to play, the Cat Tree Kitten Scratcher Play House Condo is a fantastic choice. The multi-tiered design, with two different dens, provides fun-loving cats and kittens with plenty of room to stretch their legs and really let their natural instincts out to play. The two dens are joined by multiple platforms, perches, and beds, with the highest perch at an impressive 53-inches. Constructed using soft plush and particle board, the condo is skin-friendly, and great for cats up to 22lb. With the addition of hanging balls, and scratching posts covered in sisal rope, there is plenty for your cat to explore with the Cat Tree Kitten Scratcher Play House Condo by Yaheetech. This stunning activity tower from PartySaving more than lives up to its name, providing your beloved cats with a palace to explore and conquer. The unique design more than caters to explorative cats with 4 separate sleeping nooks, each with a very different design. From the sleeping tunnel at the top of the tower, to the hammock at the bottom, there are plenty of options for your cat to choose from. Made from plush faux fur, with sisal scratch rope wrapped around 5 of the 6 pillars, the tower provides that luxury feel, whilst still being sturdy enough to cope with rougher play from adventurous kittens. This is a great option for kittens with plenty of excess energy to burn, with the ladder and central hanging rope offering multiple ways to give your kittens exercise. For older cats who aren’t quite as adventurous, or homes with limited space, the cat condo by Trixie Pet Products features a refreshingly minimalistic design. With two perches, perfect for lounging cats, and a soft den with plenty of privacy, this is a wonderful choice for cats who just want to relax. A spot of fun and exercise is not forgotten though, with the dangling toy pom-pom, and three pillars fully kitted out with natural sisal scratching rope. Whilst minimalistic, the Trixie cat condo feels very luxurious, covered in plush fabric that is ultra-soft. The fun brown and beige design is very stylish and will fit in easily in most homes. If you want to offer your cat their own private space, that is fun, comfortable, and versatile, this simple yet fun design will be a real winner. Towering over much of the competition at 72-inches, this enormous cat tree from Go Pet Club would make for a wonderful addition to any home with one or more active cats. Covered in faux blue fur, and with an outstanding number of levels for your cat to explore, and 3 high perches each with a small boarder, this is an outstanding option for adventurous cats. The stylish design is also practical, with each of the 10 pillars being covered in sisal scratching rope, making the cat tree ideal for keeping your furniture safe. With the addition of multiple hanging toys, this cat condo is perfect for active kittens and older cats who just want plenty of space to relax. Produced by AmazonBasics, the Cat Activity Tree features a basic, but highly-effective design. Ideal for smaller spaces, or single cat households, the Cat Activity Tree is compact and easy to position, with a square base and no over-hanging parts. The three tiers are easily accessible, even for cats on the slightly larger side, and each makes for a fantastic sleeping spot. The carpet covering is soft, and comfortable, while the 7 sisal rope scratching posts provide excellent traction for adventurous cats who like to keep their claws sharp. If you want a fun place for your cats to sleep and play, that doesn’t take up too much room, the Cat Activity Tree from AmazonBasics is a prime choice. For a luxurious cat tree to really treat your feline friend, this stylish and practical cat tree from Midwest Feline Nuvo is a great choice. 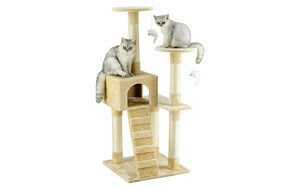 The tree features a strong and durable design, which is perfect for rougher play and more adventurous cats, as well as larger cats who need the extra support to play freely. Designed with 4 tiers, a soft lounging perch, and 2 additional spaces designed for sleeping and relaxing, your cat will truly be spoilt for choice with this stunning option. 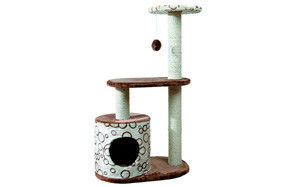 The cat tree has 3 resistant sisal scratching posts, with the platforms and beds covered in faux fur that is ultra-soft. Adding to the luxury side is the addition of beautiful fabric printing on each of the cat beds, making for a very stylish overall image. If you have multiple cats, or one very active cat, the Cat Tree Condo from SONGMICS is a wonderful choice. It has everything your cat needs to have fun, stay active, and relax in luxury. At 55 7/8-inches tall, there are plenty of tiers, perches, and nooks your cat can explore, including a large plush-lined cat condo in the middle of the tower. The addition of 2 perches, both of which are padded, and the central cat hammock, means that your cat is never going to struggle finding somewhere soft and comfortable to sleep. The duo of hanging cat toys, hanging rope, and sisal pillars, mean that there is plenty of fun and stimulation to be had with this well-designed cat tree from SONGMICS. Providing the perfect combination of mental and physical stimulation, the Tiger Tough Deluxe Playground Cat Tree by Furhaven is great for highly active cats. The fun design features a great mix of comfort and play, making the Tiger Tough Deluxe Playground Cat Tree the go to location for a little of everything. One side of the cat tree features multiple large sisal rope scratching posts, along with multiple perches, whilst the other side is reserved for comfort, with a private cat condo. The center is where most of the action is, with a hanging rope and the unique cat-IQ box, which is one of the most interesting features. With removable balls, you can really put your cat’s natural instincts to the test with games of cat and mouse - a unique bonding experience for any cat owner. What Is a Cat Condo? A cat condo, also known as a cat tree or cat tower, is a specially designed piece of furniture created to provide cats with a place to play, sleep, and exercise. Each cat condo is designed a little differently; offering a diverse range of exciting activities that are created to mentally and physically stimulate your cat. Most also feature places to sleep and relax, often created from soft material for optimum comfort. Some cat condos are designed for use by one cat, while others feature multiple areas for play and relaxation that can be utilized by more than one cat at once. Often, cat condos offer cats a private space where they can relax in safety, normally with perches high off the ground where they can’t be disturbed when sleeping or playing. There are three main materials areas that are normally considered when designing cat furniture; the material that the base and platforms are made from, the material for pillars, and the covering used. Normally, there are additional materials used to create the attachments, such as with scratching posts, which are generally wrapped in sisal. Commonly, the structure is constructed from either compressed wood or particle board, with the pillars often made from strong and durable cardboard. There is a lot more variance in the fabric coverings of most cat towers, with common materials including; faux fur, carpet, faux fleece, or plush, with some towers also featuring ultra-soft versions of the materials. What Size Cat Tree Do You Need? The size of cat tree that will be right for your household all depends on the size and weight of your cat, the age of your cat, and how many cats you have. Most cat towers are well-suited to kittens, but those with taller perches without any barriers, may prove to be too much of a challenge for the youngest of cats. A large number of condos are designed to provide the extra support and endurance needed to cope with larger cats, but not all are suitable. If you have a larger cat, then you need to make sure that the condos will be a suitable size to fit your cat, the condo is constructed from heavy duty materials, and there is strong base, so your cat won’t knock it over. For households with multiple cats, finding a condo with separate private sleeping areas can be very beneficial. These will often be included in the larger cat trees. Smaller and less active cats will only likely require a small cat tree, whilst large or very active cats may be better suited to a bigger one with more room to play and relax. While the design of each cat tree is generally quite different, there are many similar activities and features that carry through the different designs. One of the main ones is the sisal scratching post, which helps your cat to stay groomed and keep their claws sharp. Some designs feature only a few scratching posts, whilst others can feature 10 or more. How many features are included will generally depend on the size of the condo. Larger condos are likely to feature most of the common activities, and in volume, which makes them very suitable for multiple cats or those who like plenty of variance in their play. Smaller condos may only feature a couple of the common activities listed above.